Visitors to Xian must do two things: one is to see the clay figures of terra cotta warriors and horses. 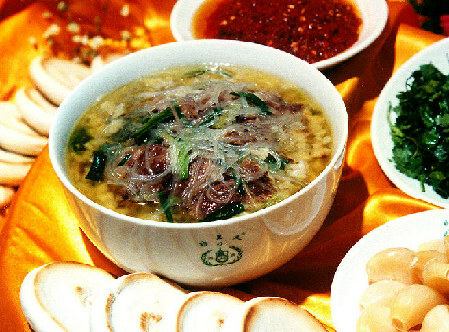 The other is to taste Yang Rou Pao Mo (a soup dish that involves breaking wheat flour flat bread into a bowl and adding a delicious mutton stock). Before dinner, you will be served one or two pieces of wheat flour flat bread which you into tiny chunks, the smaller the better. The waiter or the waitress will then hand your bowl to the cook who mixes the bread and mutton soup with an appropriate relish. When the steaming hot meal is brought in, the waiter will also offer you sweet crisp pickled garlic, coriander, and hot pepper sauce.